On the eve of a solar eclipse, it seemed a good time to blog about the moon. First of all, the eclipse, which begins early this morning US eastern time, will not be visible in US at all. 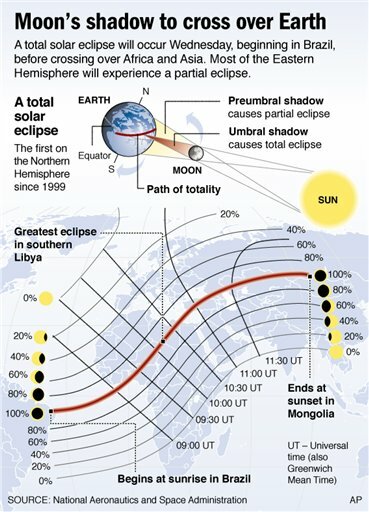 The path of totality crosses over northern Africa, the Mediterranean and central Asia. So, we will just have to settle for pretty pictures. Meanwhile, over at Anthonares, another science blog, Anthony Kendall offers some details about the sun’s silvery partner in this little moondance. In particular, Anthony explains what we have learned from bouncing laser beams the corner-cube reflectors left on the moon’s surface 30 years ago by the Apollo astronauts. The situation 600 million years ago was closer to what we experience now. A day on the earth was about 22 hours long, and the moon was approaching its current average orbital radius of about 384,000 km (240,000 mi). Billions of years from now, the two will settle into a permanent tidal dosey-do. Earth will rotate around its axis once every 47 of our current days, while the moon will revolve around the earth every 47 days. A day and a month will last the same amount of time! One side of the earth will then always see the moon (as well as occasional solar and lunar eclipses); the other side will never see the moon or any eclipses. The sun, meanwhile, will be nearing the end of its normal life. The sun is a main-sequence star, meaning that it fuses hydrogen nuclei into helium nuclei, converting mass into a lot of energy in the process. Astronomers estimate the sun has been chugging away quite happily this way for the last 5 billion years, and based on its mass, can be just as happy for another 5 billion more. But, all good things come to an end. When it exhausts the available hydrogen supply, the fusion “fires” in the core of the sun will peter out. Gravity will bring the outer layers of the sun inward, boosting the pressure and temperature of the core. Hydrogen just outside the inert helium core will then fuse into more helium. The new fusion source will bloat the sun into a red giant, perhaps large enough to swallow the inner planets, including Earth and Moon. This stage will last a few hundred million years, until the hydrogen supply once again runs out. The outer layers will come rushing in, rebounding off the now very dense core to form an expanding shell of ionized gas and dust, a planetary nebula, similar to the one pictured at right, the Cat’s Eye Nebula. The leftover core will be a white dwarf, still very hot but unable to continue the fusion process any further. The sun will be much smaller (about the size of Earth) and brighter, but unable to warm the solar system as well as it once did. Eventually, it will cool down to the ambient temperature of space itself. As they say, nothing is eternal. We and our ancestors may marvel at the beauty and awe of solar eclipses, but our descendents (if we as a species last that long) will see different celestial events than we. It’s a humbling thought.